Over the past few weeks, I have been immersed in the land of baby wearing. Baby wraps, slings, Mei Tais and soft-structured baby carriers. 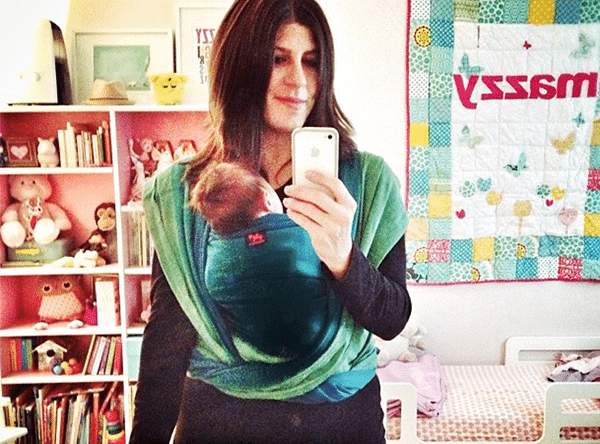 Wearing my baby inside, outside, on the couch, walking around, while sitting in a restaurant— all to tell you which is the best way to tote your newborn hands-free. I actually went to a place called Metro Minis in New York City (no longer in business), to make all my purchases and get instruction on how to use them properly. Seeing a visual demonstration, whether in-store or by using baby wearing videos online, is key. For me, baby wearing is not an intuitive thing. I am going to be discussing all the different types of baby carriers in a series of posts. Today, I will be comparing two different baby wraps. The Girasol baby wrap and the less expensive Boba baby wrap. The technique used to wrap the baby is not intuitive. I had to be shown twice- once at the store and once viewing a video on how to use a “stretchy wrap” at home before I got it down. Once you have the Boba wrap on correctly, you put your baby inside pretty easily. You carry them in the front so that they’re head is below your chin. Do the “kiss test”— see if you can easily kiss the top of your baby’s head to make sure they are situated in the right place. Since I have a newborn, I also used a rolled up washcloth inserted into the top of the Boba to support my baby’s head. The biggest problem with the Boba Wrap is the stretchiness of the material. Even if everything seems secure from the onset, eventually, the front pouch stretches. I don’t believe your baby will ever be in danger of falling out, but you might be uncomfortable with your baby’s head dangling to one side as your baby angles a little more diagonally across your belly. On the plus side, the Boba Wrap is very lightweight and made of very comfortable fabric, so it’s the closest you’ll get to feeling like your child is just an extension of your outfit. It ties in the front which makes it easy to slip on under a coat or sweater and it doesn’t get in the way if you decide to recline on your couch. The Boba Wrap ended up being my choice if I was staying in the house and relaxing. If I was venturing outside or doing anything somewhat strenuous like housework, I chose a different baby carrier. There is no question that putting on the Girasol wrap is a little more complicated than the Boba wrap. Again, I think you should have it demonstrated for you by someone who knows what they are doing so you can learn how to use and master it correctly (here is a video). I learned the most basic way of baby carrying and have been using that consistently, but as the baby gets older, there are supposedly countless other methods of wrapping. Ways to put the baby on your belly, your side or your back. Many Girasol wraps have “three color ways” which are helpful to guide you in the wrapping process, plus the tag let’s you know exactly where the middle is so you can tie your wrap evenly. After a few tries, I found the wrapping process moderately simple but the length of material is somewhat annoying. It’s not easy to fold up and put away and there is no way I would ever be able to wrap or unwrap in a public space. That material would be everywhere including on the floor. The Girasol wrap ties in the back and creates a pretty big knot (always double knot, never make a bow), so sitting down is a tad uncomfortable (you can’t sit all the way back) and putting a coat or sweater on is cumbersome (there will be a big lump in the back). But all that being said, I felt like quite the Earth Momma when I had it on. 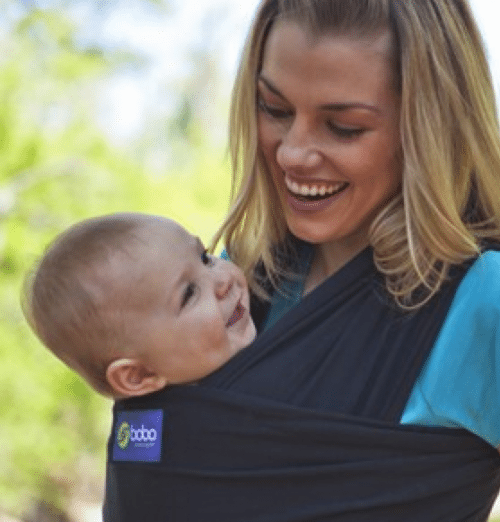 The non-stretchy material keeps the baby firmly in place and evenly distributes the weight so you can walk around with your baby hanging off your front for hours. Granted, my baby is still very small (yes, still a newborn), but it didn’t feel strenuous at all. It also looks attractive, hiding your middle and sides as opposed to accentuating them like the Boba wrap. For now, I am wearing the Girasol wrap only in the house since the tie in the back does not work well with a jacket, but I will definitely be wearing it all over town when the weather gets nicer. Conclusion: Both baby wraps work great indoors, but I would only wear the Girasol wrap out of the house because the baby feels much more secure in it. The Girasol wrap more evenly distributes the baby’s weight so I feel like I could carry her for a longer period of time. Plus, I love that the Girasol works in a variety of positions –and with kids as old as three– making the additional price well worth it. If you were intimidated by the length of the Girasol, maybe you could try a smaller length? I completely understand – I just got a Natibaby in a size 7 (approximately 5.2 metres) which is so very lovely but very, very long. If you look it up, I’m sure there would be a babywearing group in your area which you could go along and try all the different styles and sizes! This video shows a different way to tie the Girasol that you can tie before you put the baby in. I’ve been using it since my baby was about 5 weeks old. AND the knot is in front! Woven (non-stretchy) wraps are amazing, and aren’t that bad to wrap out in public once you get the hang of it. You can wrap next to the car, pushing the tails of the wrap into your car so they stay off the ground, or use a shorter length wrap for different kinds of carries. I started out with a variety of carriers (ergo, pouch sling, stretchy wrap, ring sling), but now that I’m comfy with my woven, that’s all I use. It’s the only carrier that you can use to get tiny babies on your back. Instead of tying at the back, put the knot on your side! Sittimg problem solved. Someone had to tell me too, a very ‘duh! why didn’t I think of that moment. <3 Wrapping 3, mama of 5! 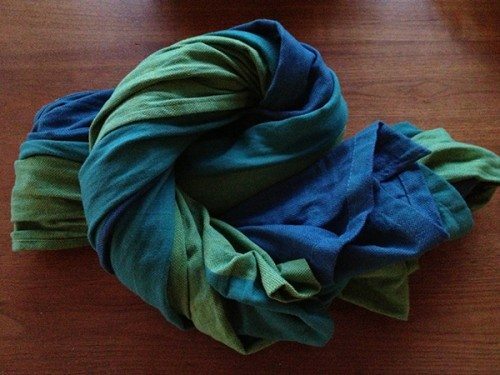 I have a (much beloved) Girasol wrap, and I second (third?) the suggestion of tying it off-center so the knot ends up on your side. Simply start with the center on your side rather by your middle and voila! Thanks for the comparison. They are both amazing. I think maybe the boba wrap is great as a starter wrap for someone who has never used one before. My wife got crazy about baby wraps, but here is a place where I hear about Boba for the first time. I must ask her if she heard about. Greetings!